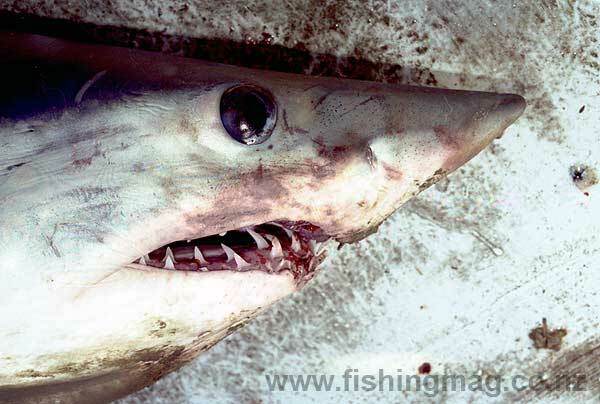 The current maximum daily limit for mako shark in New Zealand is one per fisher. The short-finned mako shark is one of the easiest sharks to identify. It has a solid yet streamlined body almost round in cross-section. The nose is sharp yet relatively short. There are five gill slits. It has a well defined caudal keel at the base of the tail. Each of the tail lopes is almost the same size with the upper lobe having a notch near the top of its trailing edge. Of the short and long finned mako, only the short fin is found in New Zealand waters. The mako has a shorter snout than the similar looking blue shark. The colour of a freshly caught mako shark is cobalt blue on the back with the lower flanks and underside being white. After being caught the colour fades to a dull grey. Larger makos tend to be a darker blue-grey on their upper surfaces. The eyes are black and have no nictitating membrane. The teeth are long, sharply pointed and lacking serrations. In large specimens, the teeth can be so long that they are still visible even when the mouth is closed. This gives the shark a most fearsome appearance. Mako Shark – Isurus oxyrinchus. The teeth are designed to seize and hold fast swimming fish. The mako shark is a member of the Lamnidae family (mackerel sharks) along with the great white and the porbeagle. Mako sharks are warm-blooded having a body temperature around 10 deg C higher than the surrounding water. This enables them to have a higher metabolic rate making it possible to swim very quickly when chasing prey. Mako sharks are known to have a short burst speed in excess of 80 kph, and can maintain speeds in excess of 30 kph for extended periods. They have been recorded swimming at speeds around 100 kph. Their ability to swim and hunt at such high speed makes it possible for the mako to chase and catch almost any fish in the sea. 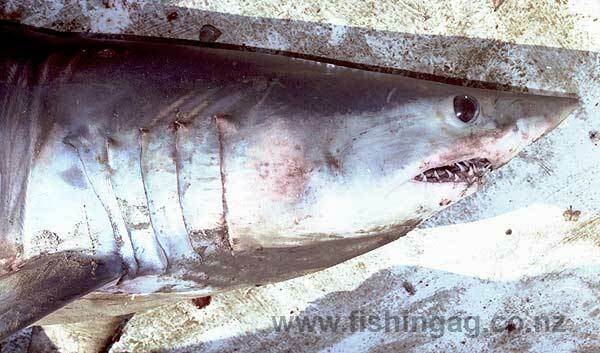 This makes the mako shark a true apex predator capable of hunting even the quickest tunas. It is easily the fastest swimmer of all the sharks. A mako shark which looks cobalt blue when first caught but quickly turns to slate grey. The mako is a palegic shark (lives near the surface of the open ocean and in coastal waters). Makos are found worldwide in sub-tropical and temperate waters ranging between 10 and 20 deg C. They are found all around the coast of New Zealand but are more common around the North Island. Makos are regularly caught off Kaikoura, Banks Peninsula, and Otago Peninsula. They like to trail schools of baitfish like kahawai, mackerel and tuna. The best months to fish for mako sharks are February through to June. Generally, they respond well to berley. 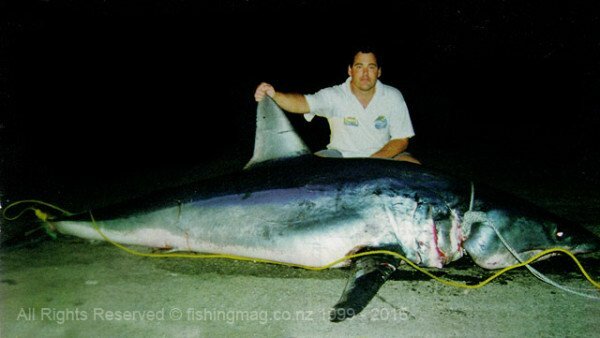 In the north of New Zealand makos are often caught incidentally while trolling lures for marlin and other billfish. Mako generally swallow their prey whole! The mako shark is streamlined and built for speed. Mako sharks are known to have a short burst speed in excess of 80 kph, making them one of the fastest fish in the sea. The standout feature of the mako shark from an angling perspective is its willingness to jump well clear of the water when hooked – sometimes as much as ten metres in the air. Makos have been reported to have landed in the boat after such jumps to the obvious distress of the occupants! At times makos appear to ignore the fact that they are hooked and continue feeding in the berley slick. However, sooner or later they realize that something is wrong and go nuts! When smaller makos are hooked and close to the boat it is tempting to gaff them early. This is a big mistake. Even a smallish, angry, “green” mako in the cockpit is no joke. They go absolutely berserk trying to escape and can do a lot of damage while thrashing about. Many experienced anglers prefer to slip a noose around their gill area to take some of the fight out of them and make them safer to handle. Generally, it is best to tire them right out before using the gaff. It is also a good idea to keep them out of the cockpit even when dead, as they have a nasty habit of “coming back to life,” after they appear completely exhausted. 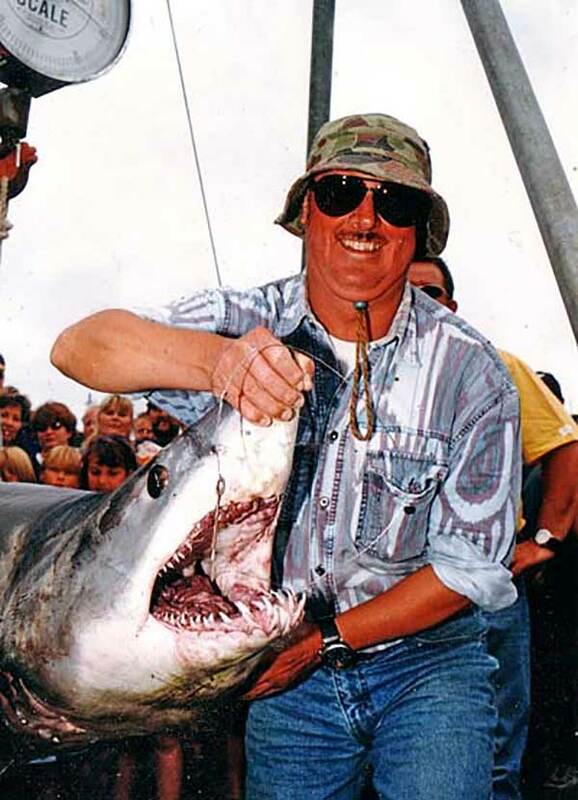 Neville Cane caught this enormous 370kg mako shark off Kaikoura in February 1999. Photograph courtesy of Nick Powell and New Brighton Sports. The mako will take almost any drifted dead bait or trolled lure. In the colder seas around New Zealand’s South Island they seem to prefer bait to lures; though dead bait is possibly the preferred fishing method in this area. Live bait fished under a balloon if fishing near surface schools of tuna or kahawai is also effective. A typical expedition for mako shark off Banks Peninsula, Canterbury, would involve heading out to sea for approximately five miles or so. This far out the water is clear and black. Then drifting while releasing a steady stream of berley into the water in the form of offal, blood, or chopped up fish mixed with water. The idea is to maintain an unbroken steady release of chum so that sharks will swim up the slick to the boat. Usually, blue sharks are the first to appear around the boat. It may take from one to three hours or more, but sooner or later a mako will also arrive at the party. At which point the object is to feed your baited hook with a kahawai fillet attached to the mako without it being taken by one of the blues. Obviously strong gear and a wire trace are the way to go. Mako sharks are very aggressive and are known to attack bill-fish. In one case reported in World Record Marine Fishes, published by the International Game Fish Association, a 331 kg mako was found to have swallowed a 54 kg swordfish whole! The mako is a solitary, fast swimming species, generally found in the open ocean far from shore. It has also been known to attack berley pots and even boats. The mako like its relatives the porbeagle and the great white shark, is ovoviviparous (the eggs hatch inside the mother and the young are born alive). A female mako shark was found to contain ten babies. Five were females and five were males. They varied in length between 63.5 and 69.8cm. See a big mako shark taken off the Canterbury Coast by Canterbury Sport Fishing Club member Grant Collins. Caught off Banks Peninsula it weighed 153 kgs. Dave Cairns, also from the Canterbury Sport Fishing Club, caught a massive mako off Kaikoura. It tipped the scales at an incredible 392kg (862.4 lb). A fully grown short-finned mako shark – Isurus oxyrinchus can reach a length of 3.7 m, and weigh in excess of 500 kg. 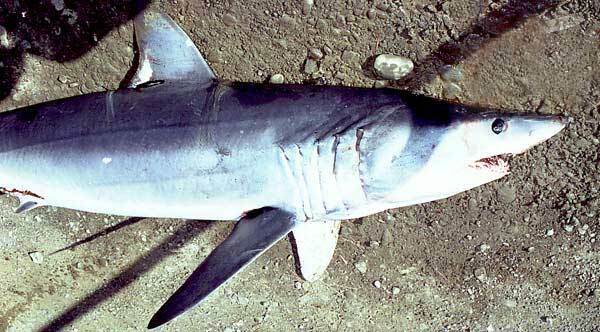 Smaller mako sharks can be quite slim but larger specimens become progressively heavier for their length. A 4.5 m mako would weigh around 450 kg. The world record for this species is 482 kg for a specimen caught off Mayor Island, New Zealand. Makos are good eating if bleed immediately and kept cold before filleting. See this shark on video. Howard Lewis caught this mako shark off Banks Peninsula on the South Island’s east coast. Members of the Canterbury Sport Fishing Club regularly target blue and mako sharks over 20 miles out to sea. Several club members hold New Zealand records catching these fish on saltwater fly fishing gear. The following paragraph below is from a pdf report on the Mako Shark from Fisheries New Zealand, Ministry for Primary Industries. It contains very useful information on the mako shark in New Zealand. with sport fishing clubs were tagged and released in 2012-13.